Too Low For Too Long Or Global Saving Glut? Both! In an interesting new paper, “The U.S. Housing Price Bubble: Bernanke versus Taylor,” forthcoming in Journal of Economics and Business, Abrar Fitwi, Scott Hein, and Jeffrey Mercer examine two possible causes of the housing price boom that preceded the financial crisis. One, which I explored in a paper for the 2007 Jackson Hole conference, argues that the Fed’s unusually low interest rate during 2003-05 was a factor. The second, put forth by Ben Bernanke in a speech to counter that view given at the 2010 American Economic Association meetings, argues instead that a global saving gut led to a capital inflow driving down U.S. interest rates, including mortgage rates. Fitwi, Hein, and Mercer step back from the debate as impartial referees—noting that there is “no unanimous agreement on either claim” and that it is important to know “more about the factors that led to one of the worst financial crises of modern time”—and proceed to test both hypotheses. 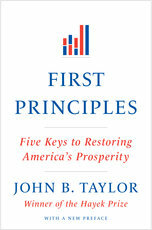 The paper has a good literature review, and clearly exposits the methodology, clarifying, for example, that the objective of the original Taylor rule was “normative, to characterize how the Federal Reserve SHOULD adjust interest rates.” As the authors argue and empirically show in this case, it is possible that there were two factors behind the housing boom, and of course there could have been more than two: Peter Wallison points to the role of Fannie and Freddie and I have pointed to lax regulation. 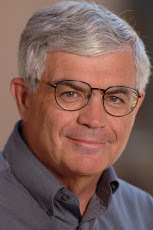 Moreover, the various causes could be inter-related and this raises a question about the paper that suggests additional future research: Could the capital inflows examined by the authors have been caused, at least in part, by the low interest rates, as much as, or even more than, a global savings glut in ways that the regression might not pick up? 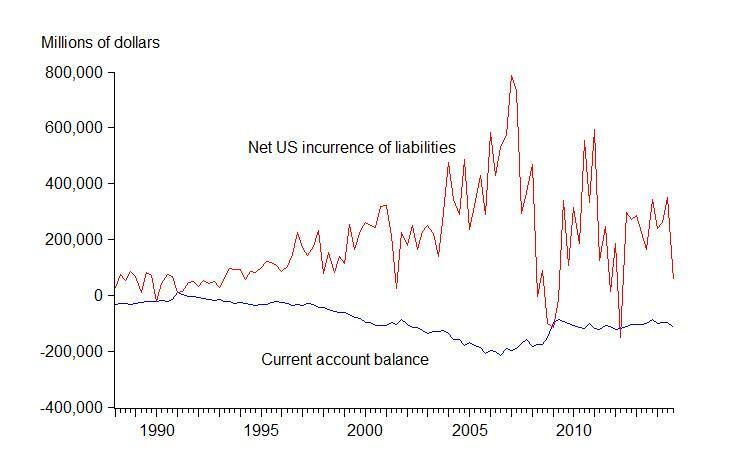 To see this consider the following chart which shows the US current account balance along with the capital inflow series. The capital inflow series in the chart comes directly from BEA—called incurrence of liabilities—because the St. Louis Fed FRED data base has discontinued the series that the authors used. There is definitely a bulge in the capital inflow series during 2003-2006, the time of acceleration in the housing price boom, which corresponds to the statistical significance in the FHM regressions. But much of that bulge can’t be explained by the current account deficit (saving glut from abroad in Bernanke’s terminology) which is on a long downward trek during this period. Claudio Borio and Piti Disyatat have made similar points. 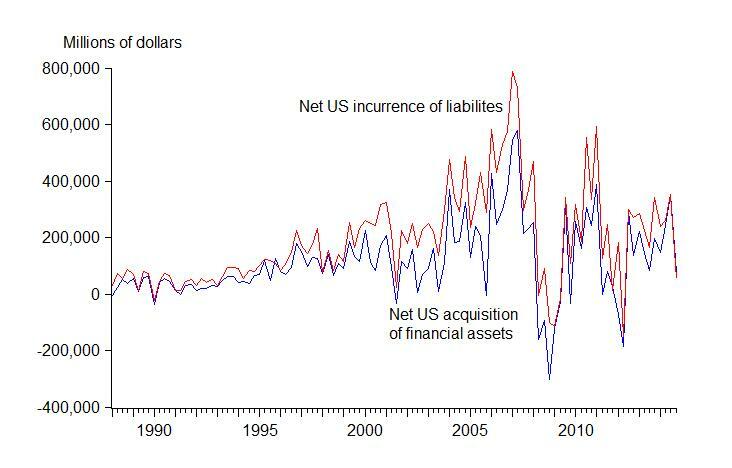 As an accounting matter, the capital inflow must also be related to capital outflows—acquisition of assets—as shown in the next chart by the blue line. There is a bulge in capital outflows also about the time of the low federal funds interest rate and could reflect a “search for yield” outside the US. The largely matching changes in capital inflows could reflect efforts of emerging market countries to prevent their exchange rate from appreciating by intervening in the exchange markets and buying dollar denominated debt, including mortgage backed securities. In my view, we need more empirical work of the kind in the Fatwi, Hein, and Mercer paper to resolve these intricate causality issues.